Point Gammon Lighthouse (also known as Great Point) is a little east of the entrance to Lewis Bay and Hyannis Harbor, and a bit over two miles north of the dangerous ledges known as Bishops and Clerks. The point's name comes from an old term used in the game of backgammon. Mariners trying to pass between the point and the offshore ledges were deceived, or "gammoned," which often resulted in a shipwreck. As the port of Hyannis grew in traffic, it became clear that a navigational aid was needed to help mariners travel the area. The Point Gammon lighthouse went into service in November 1816, with seven lamps and reflectors emitting a fixed white light. The tower was built of stone, with a 16 foot diameter. The walls were 20 feet high, and the tower was topped by an iron lantern. 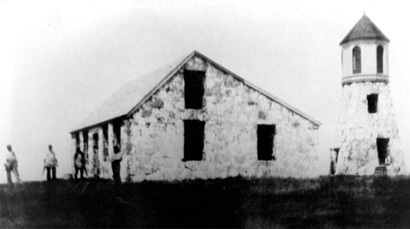 The one-and-one-half-story housing building was 16 by 30 feet, with a large front porch. The first keeper, Samuel Adams Peak, died in 1824 and his young son took over and remained keeper until 1858, when the light was decommissioned. This gives Point Gammon the distinction of having only two keepers, both from the same family. In 1855, as traffic increased further, the lighthouse was considered inadequate, and a lightship was stationed close to the Bishops and Clerks ledges instead. In 1858, the lightship was replaced by the new Bishops and Clerks Lighthouse and John Peak became the first keeper of the new lighthouse. In 1882, Great Island was sold and a game preserve was established with elk, deer, antelopes, pheasants, and other animals on the island. Non-game birds were protected and the island became one of the country's earliest bird sanctuaries. At some point after the light was discontinued, the lighthouse's iron lantern was removed. A taller structure was added to the top and used as a viewing platform. Malcolm G. Chace purchased the property in 1914. In the 1930s, the dwelling was deconstructed and the stones were recycled in the building of a new house elsewhere on the island. In recent years, the lighthouse's observatory and lantern have been rebuilt. Great Island, including the lighthouse, is off-limits to the public. The lighthouse can be viewed distantly from the Hyannis-Nantucket ferry, or from excursion boats and fishing charters leaving Hyannis. Also, a distant view of Point Gammon Lighthouse can be seen from the mainland at Kalmus Park Beach, Dunbar Point in Hyannis. 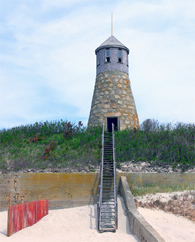 Kalmus Park is located at the end of Ocean Street and binoculars are recommended for viewing the Lighthouse. From Route 6, take Exit 6; Route 132 into Hyannis. At the Airport Rotary, take the second right onto Barnstable Road which becomes Ocean Street (after the intersection at Old Colony Road and South Street).